A designer who was left with a rotting foot after being bitten by a bug was saved after doctors used maggots to eat away his dead flesh. 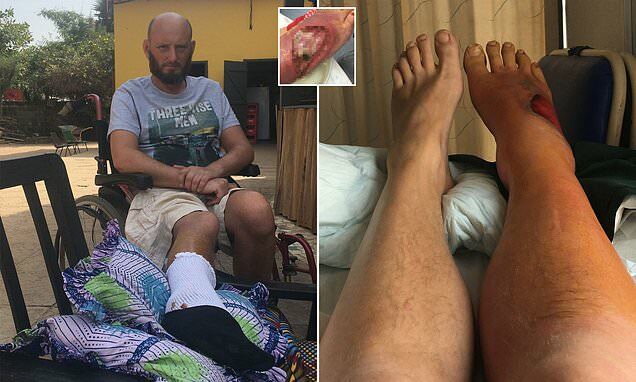 Matthew Blurton, 46, was volunteering in The Gambia in December 2017 when his temperature skyrocketed to 39.7°C (103.5°F) and a nasty blister on his foot left him unable to stand. Thinking he just had sunstroke, Mr Blurton ignored his symptoms until his leg and foot started to swell. After being rushed to hospital, doctors diagnosed Mr Blurton with the bacterial infection cellulitis and sepsis - and told his girlfriend Katie Noble, 36, he was lucky to be alive. Mr Blurton was initially treated at a hospital in Africa before being flown back to the UK, where 400 specially-bred maggots ate away at the dead flesh on his foot, which went all the way down to his bone. Although the treatment was a success, nurses were unable to remove all of the maggots, with 20 being left to decompose in his foot. Mr Blurton, who lives in Doncaster, believes he developed cellulitis and sepsis as a result of a bug bite, such as a flea or small spider, on his toe. 'I've got a puncture hole on my foot and I can only think I've been bitten on my toe by something tiny,' he said. 'I didn't feel it so I'll never know what it was. After becoming feverish and waking drenched in sweat, Mr Blurton was rushed to hospital, where he learned his foot was rotting and the dead flesh went all the way down to his bone.